A growing number of Americans are thought to be getting involved in moonshining - distilling illegal liquor. Traditionally hidden in the backwoods, stills are now going into production in cities across the nation, as Claire Prentice reports from New York. Against the backdrop of the recession and the current craze for artisan produce, illegal distilling clubs and "kitchen-sink" operations are popping up all over the US, from California to New York and Pennsylvania. Making and selling moonshine is outlawed in every US state and the police treat distilling liquor without a license as a serious crime. But while official figures are hard to come by, experts believe as many as a million Americans could be breaking the law by making moonshine - also known as white lightning and white dog. "There's been a huge increase in the number of people making moonshine," says Max Watman, whose book, Chasing the White Dog, chronicles moonshine's colourful history. He says that in recent years, the image of moonshine "has changed dramatically". "The stigma has gone. It's become cool." Moonshine has occupied a place in America's folk memory since Prohibition - the period between 1920 and 1933 when the production, sale and transporting of alcohol for consumption were banned across the US. The term moonshine usually refers to whisky but it's a catch-all term for any spirit that is untaxed and illegally distilled. Getting a distilling licence can run into the tens of thousands of dollars. But anyone found guilty of making spirits without a licence faces a fine of up to $15,000 (£9,750) and up to five years' imprisonment. Today's moonshiners are a diverse bunch. They include home distillers, high-end "mixologists", small businesses making cheap liquor to sell locally and bigger operations which sell across state lines. Though most prosecutions continue to be in the south, many of today's new moonshiners are hipster kids, foodie enthusiasts and hobbyists on America's coasts, making booze in their kitchens and bathrooms. One Brooklyn resident, who spoke on condition of anonymity, makes moonshine to her father's recipe. She says: "Growing up, me and my brothers watched our dad make moonshine in the bathtub. Now we do it." In her 20s and an aspiring musician, she is typical of the new breed of moonshiners. Rigged up in her kitchen is a gleaming copper still which she bought over the internet for several hundred dollars. By day she works in a museum where many of her colleagues know about her illicit hobby. "You've got to be careful about who you tell. I wouldn't go blabbing about it to someone I'd just met," she says. Private individuals distilling small amounts at home for their own consumption are unlikely to get caught, although police say they take all tip-offs seriously. "If someone is producing illegally distilled spirits and not paying tax then we'll go after them," says Arthur Resnick, spokesman for the Federal Government's Alcohol and Tobacco Tax and Trade Bureau. A number of distillers have set up websites and blogs where they anonymously answer questions and give advice to first-timers or anyone having problems. Colonel Vaughn Wilson is one of America's best known builders of copper stills. He has seen demand double for his stills in recent years. "I can't keep up with my orders," say Col Wilson, who lives in Arkansas and whose stills range from $300 to $11,000 in price. "I've shipped stills to every state in the US." Because prosecutions tend to be made on a state rather than federal basis, there is no record of the number of moonshine convictions made in America annually. But arrests have been made in Kentucky, Georgia and Arkansas in the past month. A man in Bell County, Kentucky, was arrested in June after police discovered 100 gallons of moonshine (378 litres) and 500 gallons of mash on his property. Police said it was part of an ongoing investigation and added that they hoped to make more arrests. "It will be a relentless pursuit until the end," said Doug Jordan, of the Bell County Sheriff's Department. A number of states have set up special moonshine task forces to combat the problem. Arrests are usually made following tip-offs from neighbours or from local stores who report sales of unusually large quantities of sugar, a key ingredient, to the police. Nathan Jones, of the Kentucky Department of Alcoholic Beverage Control, says: "We get cases every month or so. The ones that come to our attention are the big ones." Though cases of moonshine causing blindness are mostly a thing of the past, health officials warn of the dangers of drinking contaminated spirits. "You do hear stories of people blowing themselves up but if you've read the basics and are using good quality products then it's hard to poison yourself," says Mr Watman. 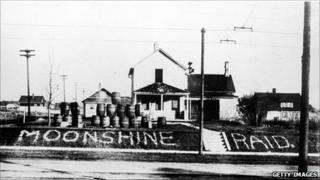 The biggest moonshine bust in the United States occurred not during Prohibition but in 2001. Dubbed "Operation Lightning Strike", it resulted in the arrest of 26 people in an operation that stretched from North Carolina to Philadelphia. The group had dodged $20m in taxes on 1.5 million gallons of alcohol. For many of today's moonshiners, the appeal lies in the pastime's illegality. Col Wilson's website includes a section entitled "Beat the law". He says: "The authorities will never stop moonshine. They are wasting their time trying."